Game is in abundance in winter months and pheasant, partridge, mallard, teal, snipe and guinea fowl are perfect for a celebratory supper. 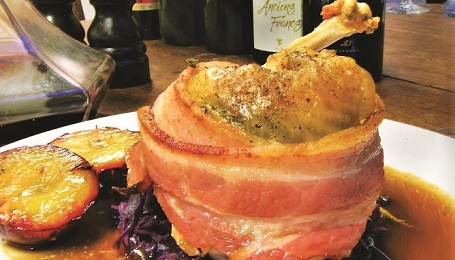 This recipe uses any Game Bird, 75g Unsalted butter, softened,3 Cloves garlic (crushed), 1 tbsp Chopped fresh mixed herbs, (I used parsley, thyme & tarragon), Bird breasts (about 100–125g each), with skin and bone, French trimmed optional,8 Slices smoked Pancetta, Sea salt and freshly cracked black pepper. Method: Combine the butter, garlic and herbs. Preheat the oven to 200°C/Gas Mark 6. Trim off excess fat and carefully loosen the skin on the breasts. Using a spoon or fingers, push a quarter of the butter under the skin, flattening and spreading it without letting it escape or split the skin. Place the breasts on a board, skin-side up. Take the tip of each breast and pull it around to the bone, forming a circle. Wrap 2 pancetta rashers around the bottom of each breast and secure with kitchen string. Place them on a lined, non-stick baking tray. Roast for 20–22 minutes or until cooked and the bacon is crispy. Remove from the oven, rest for 5 minutes and remove the string before serving. Heat oven to 200°C/180°C fan/gas 6. Grease a 25cm spring form tin, line the base and sides with baking paper. Whisk eggs with sugar until pale and thick. Sift the flr and cocoa together, onto the mixture, gently fold in, followed by the butter. Pour into the tin, ease to the edges, bake for 8-10 mins until risen and firm to the touch. Cool in the tin. Beat the chestnut purée and egg yolks until as smooth as possible. Melt the chocolate in a bowl over a pan of simmering water with half the cream. Remove from the heat, then beat into the chestnut mixture. Whisk the egg whites until stiff. In a separate bowl, whip the remaining cream until it holds its shape. Fold into the chocolate mixture, then carefully fold in the egg whites. 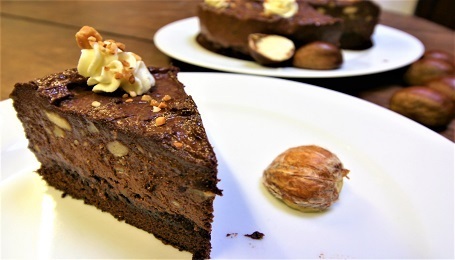 Drizzle the brandy, if using, over the sponge base, then add the chocolate mix. Level the surface and chill for 5 hrs or overnight until firm. This freezes very well or will keep refrigerated for 2 days. Along the Dordogne river you can find the crème de la crème of reds for each of these dishes, and something a bit special to drink with family and friends or, perhaps, with Christmas lunch. The vineyards all offer quality wines of varying prices, making it easy to stock up on a case or two. However, they also offer truly outstanding top quality wines, the kinds you see at eye-watering prices in the very best restaurants. Happily, we can obtain great wines at vineyard prices whilst enjoying their epic wines on special occasions. Moving north west to Gageac et Rouillac, Chateau Lestevenie offers award-winning wines and a great fizz. The 2015 Côtes de Bergerac Rouge, Cabernet Franc and Merlot blend, is a wine that equals the region’s best. Ripe red and dark berry fruit aromas with a gentle touch of oak give this big, sophisticated wine a wonderful finesse. 5€-10€ chateau-lestevenie.com. 20 km east of St Emilion is Château Moulin Caresse at Saint-Antoine-de-Breuilh. 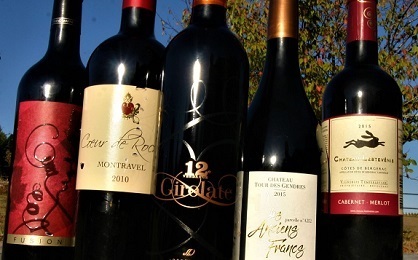 A family of well-crafted and great value wines, plus the majestic 2010 Coeur de Roche. Merlot, Malbec, and Cabernets wrapped in raisin, crowned with velvet and proudly seated on French oak. 4.30€-40€ moulincaresse.com. 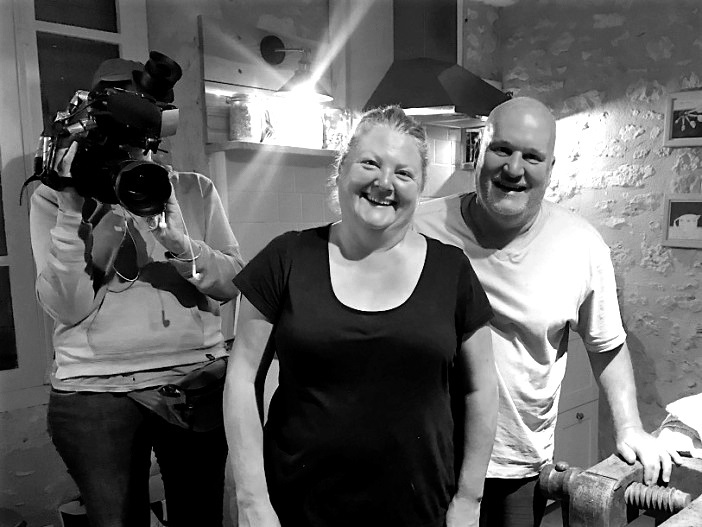 Emma and John have been in catering and hospitality for 30 years. Working with great chefs in some of the best restaurants, Emma is passionate about seasonal, fresh food and has a gutsy approach to enhancing simple flavours. John is a former UK Sommelier of the Year and winner of the Mondavi award for the best wine list in the world. He is an enthusiast for the little wine producers and seeks out unknown gems. Prior to acquiring Les Caulins, they ran their own restaurant, winning awards such as 50 best destination restaurants in the UK, Wine Pub of the year, British Cheeseboard of the Year, and Buckingham’s Best Restaurant for eight years.